For other uses, see Hickory (disambiguation). "Carya" redirects here. For the archaic nut-tree goddess, see Caryatis. For the walnut tree nymph in Greek mythology, see Hamadryad. For the other mythical figure of that name, see Carya (daughter of Dion). For the town of ancient Arcadia, Greece, see Carya (Arcadia). 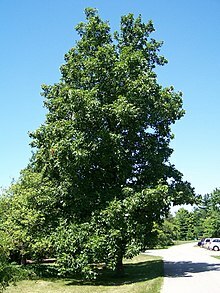 Hickory is a type of tree, comprising the genus Carya (Ancient Greek: κάρυον, káryon, meaning "nut"). The genus includes 17 to 19 species. Five or six species are native to China, Indochina, and India (Assam), as many as 12 are native to the United States, four are found in Mexico, and two to four are from Canada. A number of hickory species are used for products like edible nuts or wood. Hickories are deciduous trees with pinnately compound leaves and large nuts. Hickory flowers are small, yellow-green catkins produced in spring. They are wind-pollinated and self-incompatible. The fruit is a globose or oval nut, 2–5 cm (0.8–2.0 in) long and 1.5–3 cm (0.6–1.2 in) diameter, enclosed in a four-valved husk, which splits open at maturity. The nut shell is thick and bony in most species, and thin in a few, notably the pecan (C. illinoinensis); it is divided into two halves, which split apart when the seed germinates. In the APG system, genus Carya (and the whole family Juglandaceae) has been recently moved to the order Fagales. The hickory leaf stem gall phylloxera (Phylloxera caryaecaulis) also uses the hickory tree as a food source. Phylloxeridae are related to aphids and have a similarly complex life cycle. Eggs hatch in early spring and the galls quickly form around the developing insects. Phylloxera galls may damage weakened or stressed hickories, but are generally harmless. Deformed leaves and twigs can rain down from the tree in the spring as squirrels break off infected tissue and eat the galls, possibly for the protein content or because the galls are fleshy and tasty to the squirrels. The pecan gall curculio (Conotrachelus elegans) is a true weevil species also found feeding on galls of the hickory leaf stem gall phylloxera. The banded hickory borer (Knulliana cincta) is also found on hickories. Some fruits are borderline and difficult to categorize. Hickory nuts (Carya) and walnuts (Juglans) in the Juglandaceae family grow within an outer husk; these fruits are sometimes considered to be drupes or drupaceous nuts, rather than true botanical nuts. "Tryma" is a specialized term for such nut-like drupes. Hickory wood is very hard, stiff, dense and shock resistant. There are woods that are stronger than hickory and woods that are harder, but the combination of strength, toughness, hardness, and stiffness found in hickory wood is not found in any other commercial wood. It is used for tool handles, bows, wheel spokes, carts, drumsticks, lacrosse stick handles, golf club shafts (sometimes still called hickory stick, even though made of steel or graphite), the bottom of skis, walking sticks, and for punitive use as a switch (like hazel), and especially as a cane-like hickory stick in schools and use by parents. Paddles are often made from hickory. This property of hickory wood has left a trace in some Native American languages: in Ojibwe, hickory is called mitigwaabaak, a compound of mitigwaab "bow" and the final -aakw "hardwood tree". Baseball bats were formerly made of hickory, but are now more commonly made of ash. Hickory is replacing ash as the wood of choice for Scottish shinty sticks (also known as camans). Hickory was extensively used for the construction of early aircraft. Hickory is also highly prized for wood-burning stoves and chimineas because of its high energy content. Hickory wood is also a preferred type for smoking cured meats. In the Southern United States, hickory is popular for cooking barbecue, as hickory grows abundantly in the region and adds flavor to the meat. Hickory is sometimes used for wood flooring due to its durability in resisting wear and character. Hickory wood is not noted for rot resistance. When cultivated for their nuts, clonal (grafted) trees of the same cultivar cannot pollinate each other because of their self-incompatibility. Two or more cultivars must be planted together for successful pollination. Seedlings (grown from hickory nuts) will usually have sufficient genetic variation. ^ "Carya Nutt". TROPICOS. Missouri Botanical Garden. Retrieved 2009-10-19. ^ "Subordinate Taxa of Carya Nutt". TROPICOS. Missouri Botanical Garden. Retrieved 2009-10-19. ^ Valentine, Rudolph 2001. Nishnaabemwin Grammar, Toronto: University of Toronto Press. p.485). Philips, Roger. Trees of North America and Europe. Random House, Inc., New York. ISBN 0-394-50259-0, 1979. Wikimedia Commons has media related to Carya. Wikisource has the text of the 1911 Encyclopædia Britannica article Hickory.